A baby desert cottontail rabbit found refuge from the heat in the arms of a Maricopa Police Department veteran Tuesday afternoon. Officer Irene McCorry has worked for MPD for 11 years and responds to multiple animal calls every week on her dayside shift training other officers. July 24, she responded to a woman who was pulled over on the side of Alan Stephens Parkway in Glennwilde. “She was holding something really tiny in her hands, and we stopped because she looked like she needed help,” McCorry said. 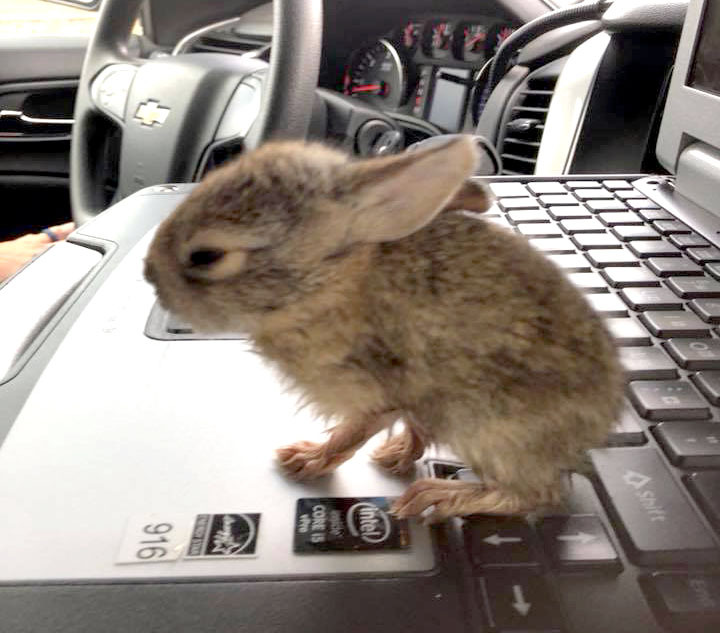 In the woman’s clutch was the baby cottontail that had been found alone in a puddle on the side of the scalding road. “She’s like, ‘Please take him,’” McCorry said the woman told her. McCorry, who previously adopted two rescue dogs in Maricopa, took the bunny home, gave it food and water, and let is bask in the comforts of air conditioning. She plans on releasing the rabbit back into the wild after it regains its strength. “My backyard has grass and there’s a couple of bunnies that will chomp on the green grass, so I figured maybe they’d take him in,” she said.